Ebbos (or Ebos) are a central part of Santeria practice. Humans and orishas both need an energy force known as ashe in order to succeed; orishas, in fact, need it in order to survive. So if one would like to be favored by the orishas, or even just pay respect to these beings that are intimately involved with forces in the physical world, one must offer ashe. All things have some quantity of ashe, but nothing is more potent than blood. Sacrifice is a method of delivering that ashe to the orishas so they, in turn, can use ashe for the petitioner's benefit. Animal sacrifices are by far the most known type of offerings. However, there are many others. One may need to pledge to do a particular action or abstain from certain foods or activities. Candles and other items may be burned, or fruits or flowers may be offered. Singing, drumming, and dancing also contribute ashe to the orishas. Food is the usual offering in the creation of talismans. A talisman provides certain magical qualities to the person wearing it. In order to infuse an item with such influence, ashe must first be sacrificed. Those who wish to more generally attract the positive aspects of an orisha might make a votive offering. 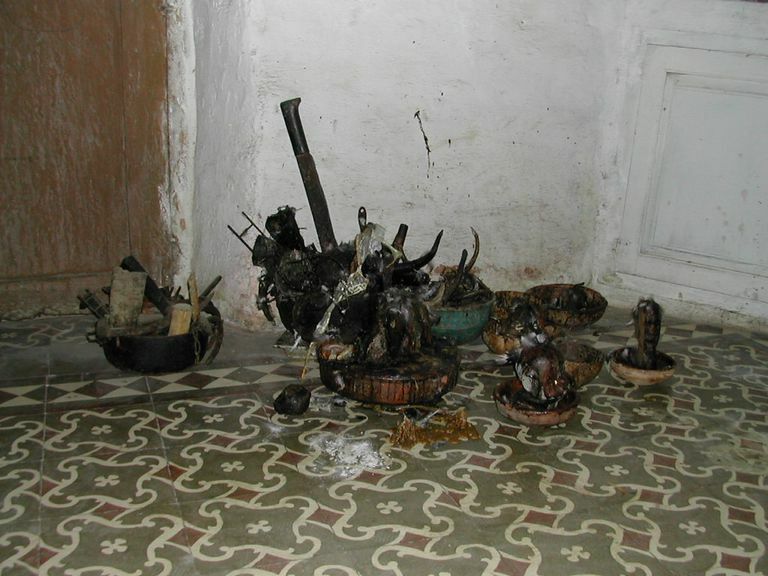 These are items that are left at a shrine or otherwise put on display as a gift to the orishas. Most ceremonies that involve animal sacrifice also involve the participants eating the flesh of the slaughtered animal. The orishas are only interested in the blood. As such, once the blood is drained and offered, the meat is eaten. Indeed, the preparation of such a meal is an aspect of the overall ritual. There's a variety of purposes for such a sacrifice. Initiations require blood sacrifice because the new santero or santera must be able to be possessed by the orishas and interpret their wishes. Santeria believers do not merely approach the orishas when they want something. It is a continual reciprocal arrangement. Blood may therefore be sacrificed as a way of saying thank you after the receiving of good fortune or the resolution of a difficult matter. When the sacrifice is made as part of purification rituals, the meat is not eaten. It is understood that the animal takes the impurity upon itself. Eating its flesh would simply put the impurity back into everyone who partook of the meal. In these cases, the animal is discarded and left to rot, often in a location of importance to the orisha being approached. The Supreme Court of the United States has ruled that religious animal sacrifice cannot be made illegal, as it falls under freedom of religion. However, those that perform animal sacrifices do need to follow certain rules to limit the suffering of the animals, just as slaughterhouses have to do the same. Santeria communities do not find these rules to be burdensome, as they have no interest in making the animals suffer. What is becoming more controversial is the discarding of purification sacrifices. The discarding of carcasses in certain locations is important to many believers, but that leaves local city workers the task of cleaning up the rotten bodies. City governments and Santeria communities need to work together to find compromises on the subject, and the Supreme Court also ruled that related ordinances should not be overly burdensome to believers.